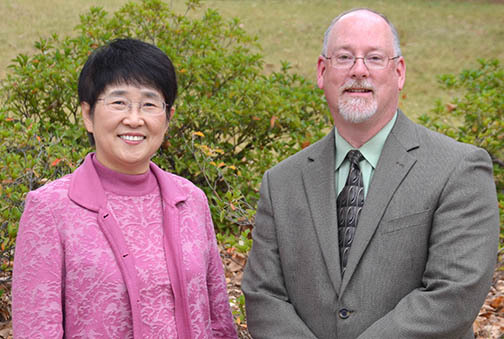 Dr. Suhyun Suh, Associate Professor in Special Education, Rehabilitation, and Counseling, left, with Dr. Andrew Gillespie, Assistant Provost for International Programs at Auburn University, right. With the development of the Hyundai and Kia manufacturing plants along the I-85 corridor near Auburn, and approximately 100 first and second tier parts suppliers, this industry now employs 30,000 people. It is estimated that our area is home to approximately 10,000 Koreans. In an effort to bridge the cultural, communication, and knowledge gap between native Alabamians and the new Korean communities, Dr. Suhyun Suh has been awarded a two-year Title VI grant from the United States Department of Education to develop an undergraduate Korean Studies and Language program at Auburn University. Suh, an Associate Professor in Special Education, Rehabilitation, and Counseling, will work closely on the grant with co-PI Dr. Andrew Gillespie, Assistant Provost for International Programs at Auburn University. Dr. Gillespie’s Office of International Programs will have major involvement in developing the initiative. The United States government has deemed Korean as a “critical” language because of its strategic importance in fostering national security and economic development. The goal is for the Korean Studies minor to be in place by the end of the two-year grant, and eventually include overseas education and internship opportunities for Auburn students. The College of Education has already incorporated aspects of the program into its courses and outreach efforts. Starting in the summer of 2014, all students in the Department of Curriculum and Teaching began taking ESOL-infused literacy classes. Many Korean students are enrolled in Auburn City Schools, where our pre-service teachers gain experience. The College’s Summer Enrichment programs include many Korean children and help Auburn’s pre-service teachers engage emerging bilingual children through “total physical response” learning techniques. And these multicultural connections have been beneficial to the Summer Enrichment Program in other ways. Following last summer’s program, PowerTech America Inc., a unit of Seosan, Korea-based Hyundai PowerTech gave $40,000 for new furnishings and materials. Among other things, the PowerTech funds allowed the program to purchase high-end sand and water tables, art easels and supplies, and many other tools that are necessities for high-quality early learning environments. Both Suh and Gillespie feel there are many more opportunities in interdisciplinary settings across the Auburn campus. Gillespie feels this is just the beginning.